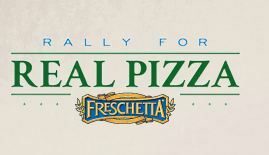 Join the Freschetta™ Rally for Real Pizza by submitting a photo to the Rally Mosaic on Facebook. Each week we will select 100 winners – to each receive 5 Freschetta® pizzas. On March 30, we will also select 10 winners – who will each receive Freschetta® Pizza for a Year! I rally for real pizza cuz all other pizzas taste BLAH compared to the great taste of Freschetta's fresh taste and ingredients on their pizzas! Frozen pizza shouldn’t simply taste better. It should be better. Freschetta® frozen pizzas are made with top-quality ingredients and taste-tested recipes, just to make sure your pizza will always deliver Fresch® flavor.